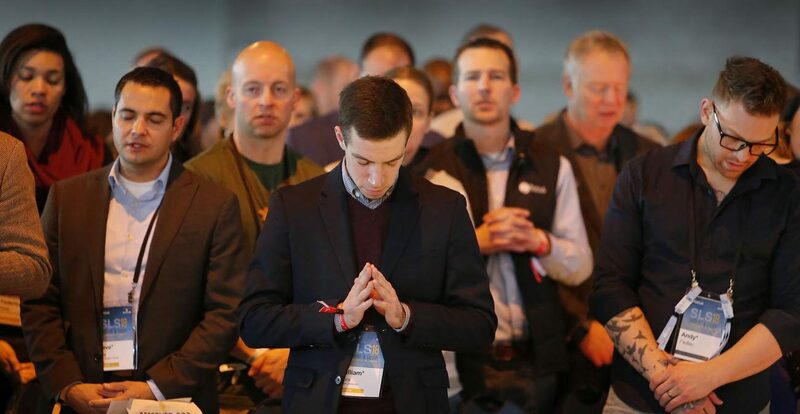 CHICAGO (CNS) — More than 8,000 people from around the country gathered at McCormick Place in Chicago in early January to gain the tools to share their faith with the world. They were attending SLS18, a biennial conference sponsored by the Fellowship of Catholic University Students, known as FOCUS. Mass was the focal point of each day of the Jan. 2-6 conference, along with talks by keynote speakers such as Los Angeles Auxiliary Bishop Robert E. Barron; actor Jim Caviezel, who played the role of Jesus in “The Passion of the Christ”; and Sister Bethany Madonna, a Sister of Life. Christian recording artist Matt Maher performed an evening concert Jan. 5. However, this year, SLS18 included lay ministers, parishioners, seminarians, men and women religious, and others who minister in the wider church, even if they are not involved with FOCUS. Each group — students, missionaries and others — had its own track of workshops and all came together for Mass and keynotes. This year’s emphasis was equipping participants with tools to evangelize. “For the last 20 years, we have seen that conferences have played a really important role in helping students and young adults take the next step in leadership,” said John Zimmer, vice president of apostolic development for FOCUS. Conferences, much like the international World Youth Days — where young people from around the world gather in one country for several days of prayer, teaching and Mass with the pope — help young adults see that Catholicism is broad and encompasses all people, Zimmer said. Much like other national and international Catholic gatherings, faith was the center at SLS but so was fun, with concerts, magicians and events such as a “Tacky Christmas Sweater Party” one evening. To engage this age group, you have to combine truth and beauty, he said. For its part, the Archdiocese of Chicago hosted an evening Theology on Tap session with Sirus XM Radio host Jennifer Fulwiler Jan. 5. Chicago Cardinal Blase J. Cupich celebrated the conference’s closing Mass Jan. 6. The archdiocese also sent a delegation of young-adult leaders to the conference. “We know that like every diocese, we have a way to go to engage the next generation of young Catholics,” Father Wojcik told the Chicago Catholic, the archdiocesan newspaper. The priest described it as a “first step” for the archdiocese to build more regionalized young adult ministry to help young people “easily connect” with one another “and find faith and service offerings relevant to them” wherever they are in the Chicago Archdiocese. Father Wojcik said that young adults are an important part of Renew My Church, the archdiocese’s wide-ranging pastoral approach to all programs, including evangelization, vocations, education and parish life. “The bold vision Cardinal Cupich has put before us is the foundation of all our programs as we develop ways of support and guidance for parishes going through changes and rethink what pastoral vitality is,” he said. “Eight in 10 young adults who were raised Catholic don’t practice their faith and as a church we cannot ignore those numbers and pretend that we are doing great,” the priest noted. Chicago’s cardinal and other archdiocesan officials hope that having a “dedicated resource engaging young adults … will bring them back to parishes,” Father Wojcik said. For Fabian Pato, a freshman at Loyola University Chicago and a parishioner at St. Bede the Venerable, conference organizers met their goal for him on at least one level. “I’ve really taken in a lot about being authentic and being authentically Catholic,” Paolelli said. “It’s a lot about what Bishop Barron said the first night. We need to speak boldly, we need to speak bold words like when the apostles were first given the tongues of fire over their heads at Pentecost.